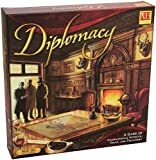 Diplomacy is a strategic board game created by Allan Calhamer suitable for 2 till 7 players. The game is a relatively very simple game, but complex in execution. It is a game of negotiations, alliances, keep promises and even break promises. To win or to survive, players will need the help of other players. It is very important who to trust and when. Each player controlls an armed force of a major European country just before the beginning of World War I. The objective of the game is to get control of the majority of the map. Each player moves his units and defeat others to win the possession of major strategic cities and provinces (supply centres) on the map. These places allow the player to produce units. There are 3 kinds of provinces in the game: land provinces, coast provinces and sea provinces. Land provinces can only have armies, sea provinces can have only fleets and coast provinces can have both. It is different than other games since there are no elements of luck (by rolling dices). Each player aims to move his or her few starting units and defeat those of others to win possession of a majority of strategic cities and provinces marked as "supply centres" on the map; these supply centers allow players who control them to produce more units. Every unit has the power of 1 and can move one space each turn and there are two moves in a year (Spring and Fall moves). Each player writes orders for his fleets and armies they are executed simultaneously. A game usually takes 4 or 5 years (so, 8-10 moves). Beginners require approx. 3 hours to finish a diplomacy game. Because it's known when the game ends, every player must plan carefully that he have the maximum number of pieces on the board on the end to win the game. The game can also end when a player controles 18 or more supply centers.